ZTE's sub-brand Nubia came out of the blue with a teaser for a flexible smartphone that will be unveiled at MWC 2019. Unfortunately, the "Flex Your Life" headline doesn't say much. While this can suggest something different than a foldable handset, most major brands are expected to unveil such a device later this month in Barcelona. Those who missed ZTE's Axon M have no reason to worry because it looks like the sub-brand of this Chinese company, namely Nubia, will soon step into the foldable smartphone sector as well. For now, there are no technical details to talk about, but one thing is certain: if Nubia will launch a foldable handset, it will definitely be more advanced than the Axon M.
The teaser image that recently surfaced online does not say much, but since virtually everyone is expected to hit MWC 2019 with foldable devices, it is almost certain that the "Flex Your Life" headline is about such a gadget and not some fitness accessory. The teaser also reveals that Nubia's devices will be on display in Hall 1, stand #1C40. This year's MWC trade show will take place between February 25 and February 28 in Barcelona, at the Fira Gran Via Conference Centre. 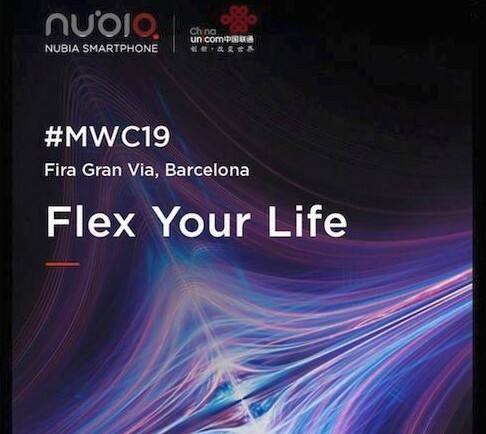 Many companies schedule special press events one or two days before MWC officially kicks off, so we might find out all there is to know about Nubia's flexible device in less than two weeks. Do you think that 2019 will be the year of the first foldable devices for the masses or not? Is there enough for this design approach to make you drop your "classic" smartphone for good?